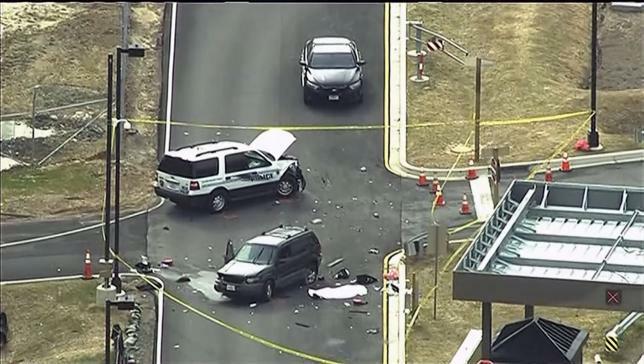 US JNN 31 Mar 2015 Washington : Two people tried to run their vehicle through the National Security Agency’s gates near Washington on Monday before guards at the spy agency fatally shot one of them, said officials, who added there was no evidence of a link to terrorism. The second occupant of the vehicle was also shot, according to one official, and a police officer was injured. Both suspects, who were dressed in women’s clothes and may be transgender, tried to drive their sport utility vehicle through an entrance at the agency’s Fort Meade, Maryland, headquarters, U.S. law enforcement and security officials said. The motive was not immediately known, but one official said drugs may have been involved in the incident that occurred about 20 miles (32 km) northeast of Washington. Officials told Reuters they could not confirm media reports that weapons and drugs were found in the SUV. The surviving suspect was a resident of Baltimore, a federal law enforcement official said. Local news media said the person was in intensive care. A law enforcement official said investigators were trying to determine the identity of the person who died. A Howard County police spokeswoman said the SUV was stolen in the morning from outside a hotel in nearby Jessup, Maryland. The NSA said in a statement that the two people in the vehicle “attempted an unauthorized entry” and failed to follow directions to leave the gate area. The vehicle accelerated toward an NSA police car blocking the road at the base gate. Officers fired when the driver refused to stop. The vehicle crashed into the police car. One of the vehicle’s occupants died at the scene of an undetermined cause, the NSA statement said. A federal official said both occupants had been shot by NSA police. Television helicopter footage showed two damaged vehicles outside the gates to NSA headquarters, just off a major highway linking Baltimore and Washington. Video showed at least one person in uniform being wheeled to an ambulance. One of the vehicles shown was marked “Police” and had its hood up. The other, a dark vehicle, had front-end damage. The FBI said it was working with the U.S. Attorney’s Office in Maryland to determine whether federal charges were warranted. This entry was posted in America, United States and tagged federal law enforcement, law enforcement, National Security Agency, NSA, Police officer, sport utility vehicle, US Spy Agency, Washington. Bookmark the permalink.